DMOZ, one of the oldest and most trusted web directories announced on their home page yesterday that they are closing up shop. The site is going offline March 14, 2017. DMOZ launched on June 5, 1998, over 18 years ago and will be shutting its doors in 14 days from now. 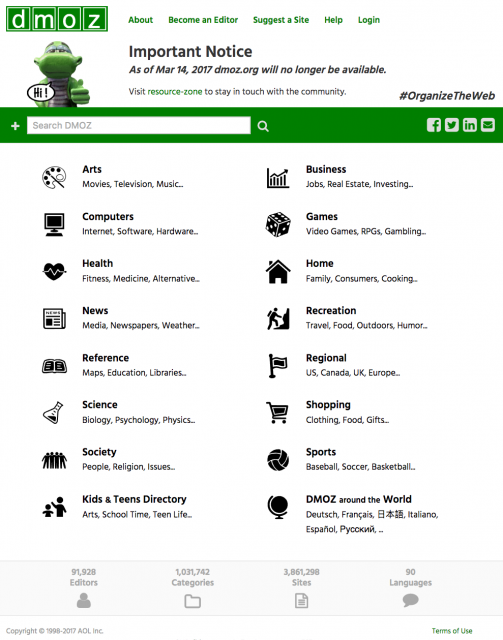 DMOZ just did a large redesign less than a year ago. This comes after Yahoo closed the Yahoo Directory a couple years ago. There is tons of discussion around this in the SEO community. We have WebmasterWorld, Creasite Forums, Google Web Search Help, BlackHatWorld and more. @merlinox Probably won't be the end of the web. SEO won't be dead. Almost certainly. Wow, not that it will change the face of the World, but it was one of the big thing of the Internet, at some point. Sad. It was so good that even Google plundered it. Old and out dated model, this was going to be on the cards eventually. After 14th March 2014, does NON-ODP will be the default Google setting? And Google will not pick up result from DMOZ? Forum discussion at WebmasterWorld, Creasite Forums, Google Web Search Help, BlackHatWorld and more.